Saint Nicholas of Zhicha, “the Serbian Chrysostom,” was born in Lelich in western Serbia on January 4, 1881 (December 23, 1880 O.S.). His parents were Dragomir and Katherine Velimirovich, who lived on a farm where they raised a large family. His pious mother was a major influence on his spiritual development, teaching him by word and especially by example. As a small child, Nicholas often walked three miles to the Chelije Monastery with his mother to attend services there. Sickly as a child, Nicholas was not physically strong as an adult. He failed his physical requirements when he applied to the military academy, but his excellent academic qualifications allowed him to enter the St Sava Seminary in Belgrade, even before he finished preparatory school. After graduating from the seminary in 1905, he earned doctoral degrees from the University of Berne in 1908, and from King’s College, Oxford in 1909. When he returned home, he fell ill with dysentery. Vowing to serve God for the rest of his life if he recovered, he was tonsured at the Rakovica Monastery on December 20, 1909 and was also ordained to the holy priesthood. In 1910 he went to study in Russia to prepare himself for a teaching position at the seminary in Belgrade. At the Theological Academy in St Petersburg, the Provost asked him why he had come. He replied, “I wanted to be a shepherd. As a child, I tended my father’s sheep. Now that I am a man, I wish to tend the rational flock of my heavenly Father. I believe that is the way that has been shown to me.” The Provost smiled, pleased by this response, then showed the young man to his quarters. After completing his studies, he returned to Belgrade and taught philosophy, logic, history, and foreign languages at the seminary. He spoke seven languages, and this ability proved very useful to him throughout his life. St Nicholas was renowned for his sermons, which never lasted more than twenty minutes, and focused on just three main points. He taught people the theology of the Church in a language they could understand, and inspired them to repentance. At the start of World War I, Archimandrite Nicholas was sent to England on a diplomatic mission to seek help in the struggle of the Serbs against Austria. His doctorate from Oxford gained him an invitation to speak at Westminster Abbey. He remained in England for three short months, but St Nicholas left a lasting impression on those who heard him. His writings “The Lord’s Commandments,” and “Meditations on the Lord’s Prayer” impressed many in the Church of England. Archimandrite Nicholas left England and went to America, where he proved to be a good ambassador for his nation and his Church. The future saint returned to Serbia in 1919, where he was consecrated as Bishop of Zhicha, and was later transferred to Ochrid. The new hierarch assisted those who were suffering from the ravages of war by establishing orphanages and helping the poor. 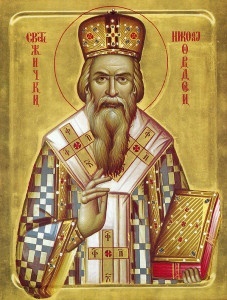 Bishop Nicholas took over as leader of Bogomljcki Pokret, a popular movement for spiritual revival which encouraged people to pray and read the Bible. Under the bishop’s direction, it also contributed to a renewal of monasticism. Monasteries were restored and reopened, and this in turn revitalized the spiritual life of the Serbian people. In 1921, Bishop Nicholas was invited to visit America again and spent two years as a missionary bishop. He gave more than a hundred talks in less than six months, raising funds for his orphanages. Over the next twenty years, he lectured in various churches and universities. When Germany invaded Yugoslavia on April 6, 1941, Bishop Nicholas, a fearless critic of the Nazis, was arrested and confined in Ljubostir Vojlovici Monastery. In 1944, he and Patriarch Gavrilo were sent to the death camp at Dachau. There he witnessed many atrocities and was tortured himself. When American troops liberated the prisoners in May 1945, the patriarch returned to Yugoslavia, but Bishop Nicholas went to England. The Communist leader Tito was just coming to power in Yugoslavia, where he persecuted the Church and crushed those who opposed him. Therefore, Bishop Nicholas believed he could serve the Serbian people more effectively by remaining abroad. He went to America in 1946, following a hectic schedule in spite of his health problems which were exacerbated by his time in Dachau. He taught for three years at St Sava’s Seminary in Libertyville, IL before he settled at St Tikhon’s Monastery in South Canaan, PA in 1951. He taught at St Tikhon’s and also served as the seminary’s Dean and Rector. He was also a guest lecturer at St Vladimir’s Seminary in NY, and at Holy Trinity Monastery in Jordanville, NY. On Saturday March 17, 1956 Bishop Nicholas served his last Liturgy. After the service he went to the trapeza and gave a short talk. As he was leaving, he bowed low and said, “Forgive me, brothers.” This was something unusual which he had not done before. On March 18, 1956 St Nicholas fell asleep in the Lord Whom he had served throughout his life. He was found in his room kneeling in an attitude of prayer. Though he was buried at St Sava’s Monastery in Libertyville, IL, he had always expressed a desire to be buried in his homeland. In April of 1991 his relics were transferred to the Chetinje Monastery in Lelich. There he was buried next to his friend and disciple Fr Justin Popovich (+ 1979). 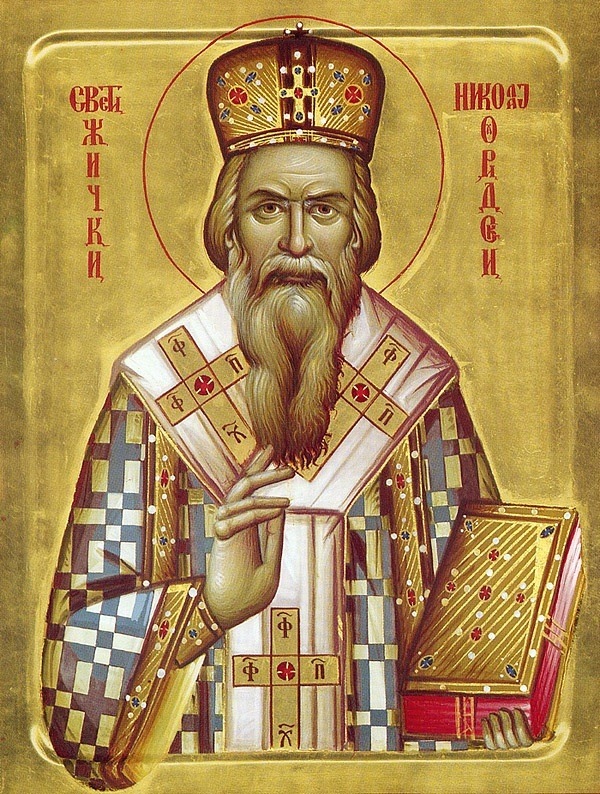 English readers are familiar with St Nicholas’s PROLOGUE FROM OCHRID, THE LIFE OF ST SAVA, A TREASURY OF SERBIAN SPIRITUALITY, and other writings which are of great benefit for the whole Church. He thought of his writings as silent sermons addressed to people who would never hear him preach. In his life and writings, the grace of the Holy Spirit shone forth for all to see, but in his humility he considered himself the least of men. Though he was a native of Serbia, St Nicholas has a universal significance for Orthodox Christians in all countries. He was like a candle set upon a candlestick giving light to all (MT 5:15). A spiritual guide and teacher with a magnetic personality, he attracted many people to himself. He also loved them, seeing the image of God in each person he met. He had a special love for children, who hastened to receive his blessing whenever they saw him in the street. He was a man of compunctionate prayer, and possessesed the gift of tears which purify the soul (St John Climacus, LADDER, Step 7). He was a true pastor to his flock protecting them from spiritual wolves, and guiding them on the path to salvation. He has left behind many soul-profiting writings which proclaim the truth of Christ to modern man. In them he exhorts people to love God, and to live a life of virtue and holiness. May we also be found worthy of the Kingdom of Heaven through the prayers of St Nicholas, and by the grace of our Lord Jesus Christ, to Whom be glory forever. Amen.